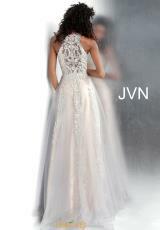 Have all eyes in this breathtaking dress JVN64157 from JVN by Jovani at your upcoming special occasion. Features a sophisticated high neckline that trails into sheer back. A flattering a line silhouette flares out at the waistline. Lace appliques adorn the bodice and trail down onto the skirt for the perfect finish.